Best Recharge Offer for Today. (Updated) - FreeServiceHindi.com - Free Services in Hindi. 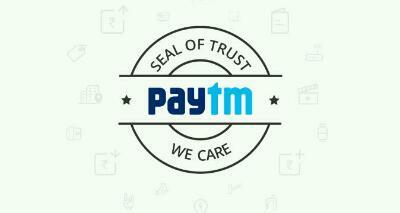 Paytm Recharge Offers To Get Rs.50 Recharge Daily by Paytm UPI Offers. Last Modified on 4th December 2018, at 04:34PM. Free Recharge Offer: Hello dosto aapka swagat FreeServiceHindi.com me. Aaj aapse bat krenge free recharge offer ke bare me. Ye jo offer hai free me Recharge ka ye Paytm ke through hai. Is offer k dwara aap free me Rs.10 ka Recharge har Month Paytm se kar skte ho. Paytm se free me Recharge krne k liye aapka Paytm Account KYC Verified hona chahiye. Aap chahe to full kyc kra skte ho ya Paytm Mini KYC se v aapko Cashback mil jayega. Agar aapne apne Paytm Wallet ka KYC verifi nhi kiya h to aap yese kr skte ho KYC Verification. .
Paytm KYC Centre Near Me, Find?. Complete Paytm Mini KYC without Aadhar. Note: Ye Recharge Offer, Month ke first Recharge or Bill Payment pe Valid h.
Ye free recharge offer, ye effectively free h. Means phle aapko Rs.10 pay krke Promocode Apply Kr k Recharge krna h. Jese hi Recharge Complete hoga within 24hrs aapko Rs.10 ka Cashback mil jayega. Is tarah aapko Rs.10 ka Free Recharge Mil jayega paytm k through. Ab aap soch rhe honge ki Paytm se Free me Recharge kese krna h, is free recharge offer k through, to tension na lein kyunki niche sare steps diye huye hain, free recharge krne k liye. Free Recharge Offer: How To Get free Rs.10 Recharge from Paytm? Paytm se Recharge krne k liye jesa hum sab jante hain ki Paytm App ya Website me login kr lena h.
Login krne k bad Mobile Prepaid Recharge Option ko Select krna h, jo ki home Screen pe hi hota h.
Jis Number ko Recharge krna h use Enter krna h, Circle Choose kr lena h & Operator v.
Fir Prooceed to Recharge pe Click kr dena h. Jese hi Click Kroge Next Screen me aapko dikhega "Have a Promocode" uspe Click kr dena h. Uspe niche diye PromoCode ko Apply krna h.
Jise hi Apply kroge, ek Message dikhega Promocode Applied Successfully you will Receive cashback within 24hrs. Ab aapko Rs.10 ka Cashback mil jayega Paytm k through. Is tarah aapne Rs.10 ka Recharge free me kr liya Paytm k through, is free Recharge Offer period me. Latest Jio Recharge Offers: Namaskar !! aaj hum aapse bat karenge jio recharge latest offers ke bare me. Jesa ki hum sab jante hain ki aaj kal lagbhag sabhi log Jio user bante ja rhe rhe hain, or karan kya hai aapko pta hai? haa kyu nahi jrur pta hoga.. Sabse pahli baat hai ye Sasta hai or sabhi Network se.. Hai naa.. Hmm.. Or uske bad aaty hai Network Availibility..
Yese me Adi aap bhi ek Jio user ho to ye post aapke liye faydemand shabit ho sakta hai. Faydemand isliye kyunki is jio recharge offer ke dwara aap apne paise bacha sakte ho. Or agar aapke paise bach rahe hain to ho gayi na fayde wali baat. To bina samay gawaye chaliye jante hain aaj ke jio recharge latest offer ke bare me yani ki Jio Recharge Today Offer ke bare me. Aaj ka Jio Recharge Offer Kya hai? Kitna Cashback Milega? Aaj me jo Jio Recharge offer ya Trick btane ja rha hun iske jariye aap apna Jio Numbner par Rs.399 wala Plan Sirf Rs.199 kar sakoge. Is offer me aapko Rs.200 ka Cashback milega. ( Is Cashback ka use aapko Purchase, Recharge ya Shopping ke liye hi karna hoga jaha par PayPal Accept hota hai..) Means jab aap Rs.399 ka Recharghe karoge to aapko Rs.200 ka Cashback milega. So finnally aapka Jio Recharge Rs.399 - Rs.200 = Rs.199 ..
PayPal Indian user ke liye ek offer lekar aaaya hai jiske tahat aapko 50% ka Cashback milega, PayPal Accept hone wale Sites pe Transaction karne par. Is offer mein aapko Maximum Rs.200 tak ka Cashback milega. Or is offer ke liye eligible hone ke liye aapka Transaction kam se kam Rs.50 ka hona hi chahiye. Is offer ka Maximum faida uthane kew liye mein aapko salah dena chahunga ki aap kam se kam Rs.400 ka to Transactiomn karein hi karein kyunki ye offer me aapko 50% hi Cashback milega or wo fixed hai Rs.200 . Ye Jio Recharge Offer 31st December 2018 tak Valid hai. Aaj mein aapko jis Jio Recharge offer ke bare me btane ja rha hun, is offer ka istemaal krne ke liye aapke pas niche diye gye websites ke accounts available hone chahiye..
Or agar aapke pas PayPal or Komparify ka Account nahi hai to aap aasany se bana sakte ho. PayPal mein Account kaise banaye ye humne pichhle post mein btaya hai aap chahein to waha se jakar dekh sakte ho ki kese aap apna PayPal Account free me Create kar sakte ho. Or bat karein ke Account ki to aap Komparify mein apna Account bana sakte ho Easly. 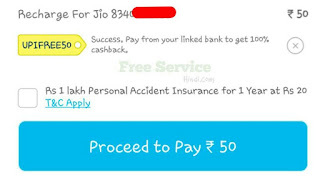 ** Aap kisi dusre Websites ya Apps se bhi is Offer ka labh le sakte ho jese ki Niki,etc..
How To Get Jio Recharge of Rs.399 at Just Rs.199, after Cashback. Login ya Sign Up karne ke bad, Komparify ke HomePage par aapko "Recharge" ka option dikhega. uspar click kar dena hai..
Jese hi Recharge par Click kroge aapse aapka Mobile Number, Operator, State and Recharge Value puchha jayega. Recharge value me aap kuchh bhi daaal sakte ho apne anusarr. Main aapko salah dunga ki Rs.399 wala plan Recharge karne ke liye kyunki jio recharge today offer ke dwara aapko maximum Cashback milega, Agar aap jio Recharge 84 days wala karte ho. Jese hi sab details enter karke aap 'Recharge' par Click karoge, ab aapse Payment Method Choose karne ko kaha jayega. Ab aap dekhoge ki Rs.5 tax add karke, Rs.405 aapse Payment karne ko kaha jayega. Ab aapko "PayPal" as a Payment method Choose kar lena hai. Jese hi PayPal ko Choose kar ke Proceed karoge aapse Terms & Conditions ko Accept kar "Pay Rs.405" pare click kar dena hai. Ab aap dekhenge ki PayPal ka Login Page aapko dikhega, aappko apna Login Credential daal kar Login karke Payment kar dena hai. Jese hi payment successful hoga aapka Recharge bhi done ho jayega..
Or Recharge complete hone ke turat baad aapke PayPal Account mei Rs.200 Cashback Voucher add kar diya jayega. To is tarah se aapka Rs.399 ka Jio Recharge matra Rs.199 mei ho gya..
Offer sirf PayPel ke Indian Account se first Transaction par valid hai. Jio Recharghe Offer 31st December 2018 tak valid hai. Cashback aapko PayPal Account me Discount ke form me milenge. Minimum Transaction Rs.50 ka hona chahiye elegible hone ke liye. PayPal se jo aapko Discount Coupon milega uska use aapko credit hone ke within 60 days karna hoga. Offer ko sirf ek accont se ek bar hi use kiya ja sakta hai. Get Rs.50 Discount on Rechrge of Rs.51 or More. 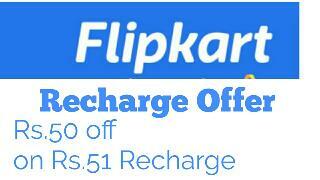 Flipkart Mobile Recharge Offer- Flipkart is offering Rs.50 Instant Discount on Mobile Recharge of Rs.51 or More on paying by Debit/Credit card. Flipkart is Providing “Recharge” feature is their application which is powered by Phonepe. This Recharge offer is Valid for all users. Offer is valid for Limited Time, So hurry up. This offer will give you instant Off on prepaid mobile recharges on Flipkart during this offer period. !! How To Get Instant Rs.50 Discount on Prepaid Mobile Recharge of Rs.51 or More.? 2. After Installing the App, Open App. 3. Click on the Top left corner, and Go to Recharge Option. 4. Allow Flipkart for few Permissions. 6. And Pay the rest Amount by Credit Card or Debit Card. This offer is valid for New & Old both users. This can be availed only on Prepaid Mobile Recharge. To be eligible for this, Minimum Recharge should be of Rs.51 or More. Payment should be made with the help of Credit/Debit Card. This is Valid for first All flipkart Users, New and Old. From 09th October 2018, 21:00 hrs to 14th October 2018, 23:59 hrs. How many times we can avail this offer? Any user can use / avail this offer only one time. One Debit/Credit card can be used only one time during this offer period. Offer valid for one time per device. When I get the discount or benefit? You will get Instant discount of ₹50 on the transaction amount if amount to be paid from credit / debit card is ₹51 or above. 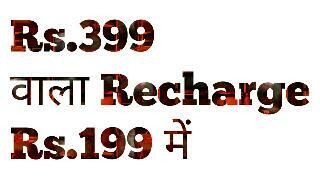 I hope you have got all details about above Listed Recharge Offers or Instant Discount on Prepaid Recharges. If you have any questions or concerns regarding this then feel free to comment below.